The Vickers Combat Application Sling has become known as one of the go to sling for sport shooters, hobbyists and even serious users like the police and military. Larry Vickers relied on experience he acquired during a 20-year career in the US Army, most of it as a Delta Force Operator, to design the sling with features in mind for the practical shooter. The sling became so popular with Marines that it was adopted as the general issue rifle sling Corps wide! 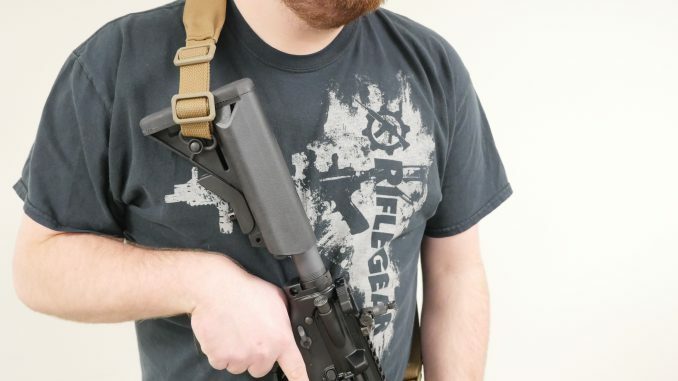 The sling mounted on the excellent Knights Armament SR-15 is a padded variant so that the shooter is more comfortable when wearing the rifle for long periods of time. Blue Force Gear also offers a non-padded sling for those shooters looking for a lightweight and less bulky sling option while retaining the same functionality as the padded sling. The closed cell foam padding is fully enclosed in tough Cordura fabric that is dyed with a process that keeps the fabric soft enough that it won’t irritate skin when worn for long periods of time but can still handle a beating when you are in a rough spot. The hallmark, standout feature that the Vickers sling brings to the table is the one-handed adjustment system that allows you to cinch a sling up with taking the rifle off or any fiddly maneuvers. The tri-glide with the sewn on adjustment handle allows you to pull the rifle into your body nice and tight when needed in a pinch and loosen it quickly when you are ready to get the rifle back into the fight. This particular model of Vickers sling has a metal loop connecting the two parts of the sling for durability, although the newer Acetal hardware (like all the adjustment buckles) had proven to be a reliable alternative to the rust prone metal loop. Blue Force Gear is constantly evaluating materials and making improvements to their product line, the metal to Acetal loop change is a result of that commitment to getting the consumer the best possible product. A side benefit to the tri-glide slider is the ability to cinch the sling down and get a good, solid sight picture when shooting from a standing position. Using a two point sling in the same manner as a single point takes near no getting used to. In fact, draping the sling over your head becomes second nature. The padded portion of the sling rides on top of your shoulder like a backpack strap to shield you from the weight of the rifle. After all, even 6 pounds can become cumbersome after a long enough time. Shouldering the rifle is equally natural, you don’t even notice that there is a sling attached to the gun until you let the rifle fall back down to its resting position when transitioning to a handgun or just lowering the rifle. To really round out the perfect rifle, you need the perfect sling. In our humble experience, the Vickers sling is probably the one to have. If there is something better, we haven’t found it yet. Make sure that you check out our website for the best prices on Blue Force Gear Vickers Combat Application Slings.